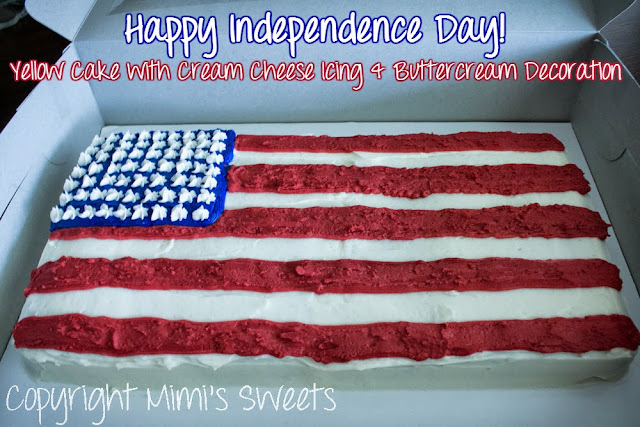 Home / buttercream icing / Charlotte bakery / cream cheese icing / decoration / Fourth of July / Independence Day / Mimi's Sweets / special requests / yellow cake / Happy Independence Day! I know, I know-- this is a bit late being posted. Better late than never, though, right? Haha. This buttery yellow cake is 18 x 9 inches, covered in cream cheese icing, and decorated with buttercream. It was made for an office party for the 4th of July, and there was none left by the end of the work day. If you're looking for something special for an office party or even just a gathering, look no further! Have a special request? No problem! Email me with your request or check out my Menu Page or earlier posts for some ideas!